Economists, central bankers and governments are all taking a gloomier view of the global economy. Good morning! Jeff Sparshott here to take you through the day's most important economic news. Send us your questions, comments and suggestions by replying to this email. Economists sharply lowered their forecasts for employment and economic growth in the first quarter. In a new Wall Street Journal survey, private-sector forecasters said they expect U.S. economic output to grow, on average, at a 1.3% pace in the first quarter. That would be the weakest since the end of 2015. Economists also trimmed their monthly payroll forecast to an average pace of 170,805 new jobs per month, down from 207,583 in the February survey, Harriet Torry reports. The latest downgrades follow data suggesting the economy is cooling. U.S. payrolls rose by just 20,000 in February, the slowest pace since September 2017. A growing number of economists say the Federal Reserve’s next move will be a rate cut. About 18% of economists surveyed this month expect the Fed to lower them, up from 10% in February’s survey and 4% in January. While still a minority, the shift highlights a sharp change in the economic outlook. As recently as January, more than 80% of economists expected the Fed to raise again before September. Now, most don't expect an increase until September or later, David Harrison reports. The U.S. job openings and labor turnover survey for January is out at 10 a.m. ET. The Baker-Hughes rig count will be released at 1 p.m.
Federal Reserve real-time growth trackers also are pointing to a pretty tepid start to the year. But the divergence is stark: The Atlanta Fed's closely watched GDPNow currently has the first quarter pegged at a 0.4% annualized rate. The St. Louis Fed Nowcast is a more robust 2.2%. Either would be a slowdown—but one is downright anemic. Why the difference? One of our favorite themes: Atlanta's GDPNow indicator uses more hard data while the St. Louis’s index is based more on soft data. So, for example, gauges like consumer sentiment have looked a lot better than actual consumer spending. Plus there just isn’t as much first-quarter hard data out yet. The Bank of Japan offered a bleaker picture of the economy on Friday and left its ultra-easy monetary policy on hold. The central bank said Japan’s exports and production have shown some weakness, a downgrade from its January assessment. It also adjusted its earlier view that overseas economies were growing firmly on the whole, saying some slowdowns have been observed. The central bank stuck to its overall assessment that the Japanese economy is “expanding moderately,” Megumi Fujikawa reports. China’s government will consider cutting interest rates and banks’ reserve requirement ratio to counter new downward pressure on the economy, Chinese Premier Li Keqaing said Friday. Mr. Li said Beijing needed to keep economic growth within a reasonable range to prevent waves of layoffs. China’s economy reported its slowest growth in nearly 30 years last year and momentum continued to slow at the start of 2019. In response, the government earlier this month announced tax cuts and efforts to spur infrastructure investment, Grace Zhu reports. China made last-minute changes to a proposed foreign-investment law, trying to address U.S. complaints about forced technology transfer and bolster prospects for a trade deal with Washington. The national legislature quietly amended a draft of the law to tighten up channels used to leak intellectual property. The new language takes aim at the regulatory review panels, known as “conformity assessments,” that foreign companies must pass. The Trump administration says the process is used to leach proprietary information and force technology transfers, Lingling Wei and Chao Deng report. President Trump's take: "So the China talks are moving along. As to whether or not we'll strike a final deal, that I would never want to say." British lawmakers voted to delay the U.K.’s departure from the European Union by at least three months beyond a March 29 deadline. The other 27 EU governments must unanimously agree to any extension, a matter they will consider next week. Third time's a charm? Before she negotiates with the EU over an extension, Prime Minister Theresa May will likely aim to coerce recalcitrant elements of her Conservative Party into backing a Brexit deal they have soundly rejected twice. Her hope is that lawmakers who want a pure break with the bloc will now see the deal as their least-bad option: Delay could lead to a preservation of closer ties or even a second Brexit referendum. The U.S. needs to rethink the way it finances higher education. Instead of forcing students to borrow, "We should replace this system with an 'equity' model, in which funders pay for a student’s education in exchange for a stake in their future success. Students who achieve high earnings—tech engineers, bankers—would pay back more than the cost of their education. Their lower-earning peers—high school maths teachers, Salvation Army workers—would pay back less," Sheila Bair writes in the Financial Times. Neither robots nor automation have caused worker wages to stagnate. "What did? There is a growing though incomplete consensus among economists that a key factor in wage stagnation has been workers’ declining bargaining power—a decline whose roots are ultimately political," Paul Krugman writes at the New York Times. President Trump is making the trade deficit bigger. "Pretty much anyone with a passing knowledge of macroeconomics could have predicted that this would be the likely result of moves by Trump and Congress to stimulate the U.S. economy with bigger federal deficits," Justin Fox writes at Bloomberg Opinion. "That Trump himself did not see this coming is another indication that, as someone recently said, the man doesn’t understand much about macroeconomics." To add to your Google calendar app on mobile, click here. Happy Monday. I'm Jessica Menton, getting you up to speed ahead of the shortened holiday trading week. Stocks are inching toward records. Futures are rising premarket as the S&P 500 sits just 0.8% from its September high. Although U.S. financial markets will be closed in observance of Good Friday, it's still a jam-packed week with data on retail sales, industrial production and housing starts on deck. Earnings season is heating up with more big banks. Investors will hear from Goldman Sachs and Citigroup this morning, followed by Bank of America and Morgan Stanley in the coming days. Other notable companies opening their books this week include Netflix and IBM. Meantime, health-care stocks have fallen out of favor. Below, I delve into what's been holding back the group this year. Global stocks were muted after climbing last week, as trade tensions remained a pressure point amid weakening world economic growth. Johnson & Johnson and UnitedHealth are set to release earnings Tuesday. 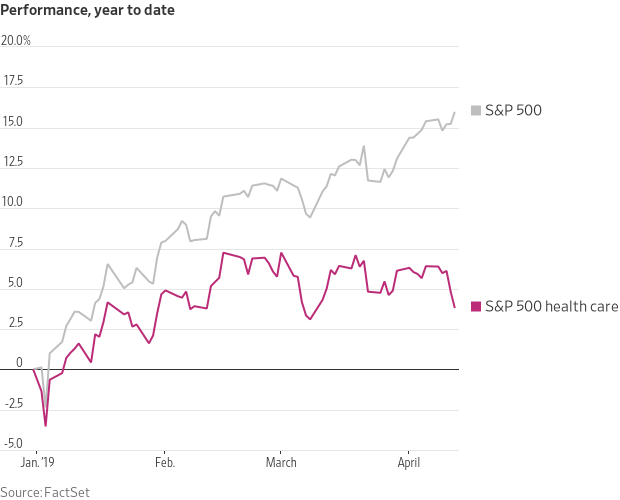 Major U.S. indexes are marching to new highs, despite getting scant help from the S&P 500’s best-performing group last year: health-care stocks. Health care is the worst-performing sector in the S&P 500 so far this year, with shares up 3.8% compared with the broader index’s 16% gain. 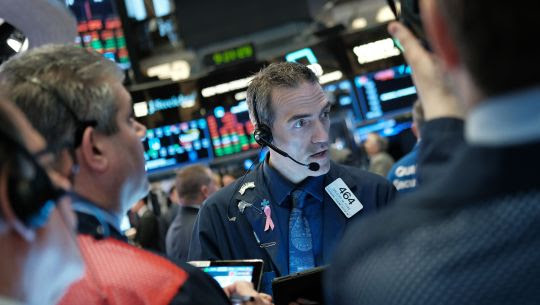 That marks a stark contrast after health-care stocks emerged as a market leader last summer as technology shares came under pressure, helping push major U.S. stock indexes to fresh highs in the late summer and fall. Some investors favor health-care stocks when market volatility increases because of their relatively steady earnings and dividend payments. The threat of tighter health-care regulation has also pulled down shares this year. Additionally, Walgreens Boots Alliance this month lowered its annual earnings forecast after CVS Health did the same in February. Both health-care conglomerate Johnson & Johnson and UnitedHealth Group, the parent of the nation’s largest health insurer, are scheduled to release results Tuesday. Despite a recent slump in health-care stocks, the sector remains a bright spot on the earnings front. Health-care companies are forecast to report the second-highest profit growth of the S&P 500’s eleven sectors in the first quarter, climbing 4% from a year ago, according to FactSet. In addition to drugstore stocks, health insurers are also sources of recent pain. In February, House Democrats outlined details of a Medicare for All bill that would create a new federally financed health system. Concerns over stringent regulation on managed-care businesses have pressured stocks with medicare exposure, with insurers UnitedHealth Group, Humana and Cigna all down double-digit percentages in 2019. Still, health-care providers within the broader sector are expected to report double-digit earnings growth for the quarter, climbing 15% from a year ago, according to FactSet. Another area of weakness this year has been pharmaceutical companies. Of the six industries in the health-care sector, the pharmaceuticals group is the only one that is projected to report a decline in earnings growth, FactSet data show. Investors typically scoop up shares of heath-care stocks for their growth and defensive nature. Some of the largest health-care companies offer investors yield, with a valuation that is less stretched than other yielding-producing corners of the market, such as utility stocks. Health-care shares in the S&P 500 are trading at 15.5 times their forward 12 months of earnings, below with the overall index at 16.77, according to FactSet. As a point of comparison, the utilities sector is trading at 18.41 times their forward 12 months of earnings. Is the threat of new regulation preventing you from scooping up health-care stocks? Let the author know your thoughts at jessica.menton@wsj.com. Emailed comments may be edited before publication in future newsletters, and please make sure to include your name and location. About $11.3 billion flowed into investment-grade corporate bonds during the week ended April 10, the second biggest weekly net inflows ever, according to a Bank of America Merrill Lynch analysis of figures from fund tracker EPFR Global. With 6% of the companies in the S&P 500 reporting results for the first quarter through Friday, 83% have topped earnings-per-share estimates and 59% have beat on revenue expectations, according to FactSet. On this day in 1998, the New York Stock Exchange implemented its “circuit-breaker” rules that mandated trading halts when the market dropped at least 10%. The New York Fed's Empire State manufacturing survey for April, released at 8:30 a.m. ET, is expected to tick up to 5.3 from 3.7 a month earlier. The stock rally is defying a dimming outlook. Many investors are trying to square their big returns with the fact that they have arrived while the global economic outlook has grown progressively dimmer, leaving some to wonder how much longer the rally can last. Trading activity has stalled as stocks approach records. Trading volumes have fallen as major indexes climb toward all-time highs, the latest sign that investors remain cautious despite 2019’s powerful stock rebound. The Deutsche-Commerzbank deal might rest on a mountain of “badwill.” Deutsche Bank will likely depend on an obscure but valuable accounting quirk known as negative goodwill, or so-called badwill, to make a deal for Commerzbank workable. Here’s what you need to be on the Fed – and it isn’t a Ph.D. In these populist times, knowing too much economics means you’re out of touch, arrogant, and wrong. Once more with feeling: Fix your withholding! If this year’s tax refund fell short—or there was a surprise bill—here’s how to avoid a rerun. Beware the bold claims of tax-loss harvesting. The exchange-traded fund industry has claimed credit for democratizing strategies once available only to the rich, such as trading oil futures or using leverage to amplify returns. The latest target: your tax bill. Neiman Marcus is pushing refinancing, highlighting lenders’ vulnerability. Neiman Marcus is poised to become the latest U.S. business to push lenders into supporting a refinancing, a trend that has raised concerns that some companies might be delaying a reckoning on unsustainable debt loads. Fidelity’s index-fund bashing misses the mark. A recent study from Fidelity Investments purports to show that active funds outperform passive. But there’s a catch. Advanced Disposal Services: Waste Management Inc. is buying the waste and recycling collector for around $2.9 billion in cash, in a deal that will marry the No. 1 and No. 4 companies in the sector. Caesars Entertainment: The casino operator is preparing to name Anthony Rodio as its next chief executive and is expected to announce that it has formed a board committee to work with bankers to evaluate takeover interest it has received, The Wall Street Journal reported. Pioneer Natural Resources: The shale company rallied 12% Friday, its largest percentage gain since August 2013, on hopes that Chevron’s $33 billion deal to acquire Anadarko Petroleum could start a wave of consolidation in the U.S. oil patch. Facebook: Reed Hastings, chairman and chief executive of Netflix, is leaving Facebook's board, the social-media company said late Friday. CBS: Former CBS Chief Executive Leslie Moonves forfeited nearly $34.5 million of his compensation package as part of a separation agreement with the company amid accusations of sexual harassment last year, the company said in a securities filing Friday. Anthem: Shares of the health insurer dropped 8.5% Friday, their biggest percentage loss since July 2012. Fox Business journalist Maria Bartiromo, the first woman to report live from the floor of the New York Stock Exchange, speaks to WSJ columnist Veronica Dagher on her path to success.